The MDNA Tour DVD released in June ? The DVD should be about 107 minutes, Madonna's speech probably shortened to give more importance to dance and sing. Interscope made a first cover with a picture of Madonna during the Transgression Part on the show (from Girl Gone Wild to I Don't Give A), but Madonna seems to decline, in order not to revive the gun and violence controversy. 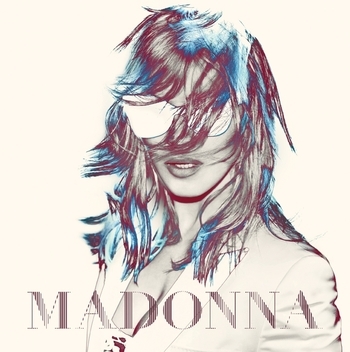 A second cover version must includes a picture taken while Madonna singing Masterpiece, from the Prophecy Part of the show. Moreover, the release could include a Deluxe Edition with a DVD+Blu-Ray+Digital Copy Pack, while no Live CD seem to be planned. "Behind the scenes on MDNA, a backstage trip around the globe"